ShopSavvy was one of the best early Android applications. It launched in October of last year after winning one of the initial Android Developer Challenge top prizes (when it was still known as GoCart). But despite the success it has seen on Android, one question remained: When would it be available for the iPhone. Today, it finally is. Developed by the guys at Big In Japan, ShopSavvy is an app that allows you to use your device as a portable barcode scanner. You point your phone’s camera at any barcode and it will read it, do a product look up, and give you information about the product, as well as where you can find it online or at nearby stores and for how much. Obviously, something like this is a window shopper’s dream. And while you might think retailers may hate something like this, because it gives shoppers all of their competitors’ information, increasingly, they’ve been working with ShopSavvy to come up with ways to allow you to make buying in their stores even easier. And honestly, what are the retailers going to do anyway? All of this information is out there on the web, ShopSavvy just gives you easy access to it. Are they going to ban mobile phones in their stores? That’d be a great story for us if that were to happen. So what took so long? 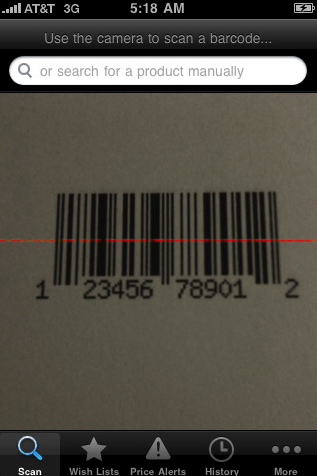 Well, for a while, the iPhone lacked a key feature needed for the barcode scanner: A camera that had auto-focus. The iPhone 3GS gained that, and so the team should have been good to go. The plan was originally to release the app this summer, but a internal mix up involving a team member who had since departed registering the app to his iTunes account caused a delay (more on that here). After some back and forth with Apple, Big In Japan was finally able to get that resolved. While it’s great to see this product on the iPhone, it is a little buggy right now. The main issue is that it’s hard to scan the barcodes properly. Big In Japan says a fix for that is coming shortly, based on what they’ve learned from beta testers, but keep that in mind when using the app for now. My own tests confirm that it is a little hard to scan, but it seems to work most of the time. For example, I just scanned the protein bar I’m eating, and ShopSavvy pulled it up right away and gave me a pricing rundown. Nifty. 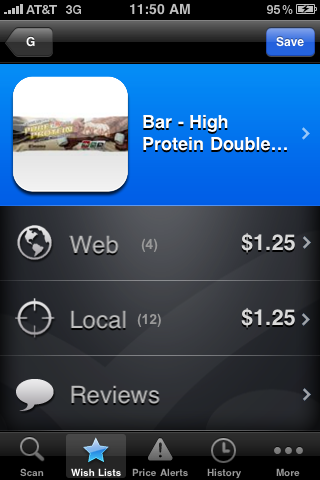 ShopSavvy is available for free in the App Store. Find it here. Also read about Big In Japan’s other big plan for the iPhone (100 apps in a year) here.